Inflation has been noticed unexpectedly high in Nepal without serious economic cause. Among all, the prices of consumable items have risen steeply. From 2007 to 2018, the average food inflation rate lingered at 10 percent, leaving 2009 with the worst inflation figure of 21 percent. As a result both poor, as well as middle-income groups, have been hard hit. Essentially, whenever there is an exorbitant price rise in consumable items, the government tries to bring the situation back to normal. This is why developed economies have their current prices only slightly higher than prices 20 years back. For instance, the average inflation rate in Europe has just risen by 2.46 percent since 1997. But Nepal’s case is different. Since the past two decades, the food price has blazed through the roof to unimaginable heights and the government has done nothing to pull it down. Fundamentally, countries slide in economic performance whenever inflation stays for a longer period. We have seen such situation in Zimbabwe and Venezuela. Zimbabwe experienced the worst rise in prices faster than wages and incomes. Even the billionaires over there were considered poor due to hyperinflation. We haven’t reached there yet but if we cannot check inflation now, that day won’t be very far. Inflation has had the worst effects on Venezuela. IMF forecasts that Venezuela’s year-end annual inflation in 2018 will be 12,874.6 percent. IMF has also said that Venezuela’s hyperinflation is poised to reach an annualized rate of one million percent by year’s end. There are many reasons why price of consumer items has risen disproportionately in Nepal. Depreciation of the exchange rate, monetary stimulus to the economy, higher demand from the fiscal stimulus, fall in exchange rate, higher indirect taxes and wage-price effect are some. But there is another factor we have often overlooked: Role of middlepersons or intermediaries who have artificially inflated the prices by skimming the profit. They have been abusing their market power at all level of demand by increasing prices well above costs especially in the consumable goods. Mostly, the price of vegetables and other food items has skyrocketed. It is because instead of letting the invisible hands of the market determine the prices of such items through demand and supply, the middlepersons themselves fix the price. They do so by shoveling abnormal profit margins by buying the farm products at minimum price from the farmers and charging exorbitantly high for their unsolicited services. What’s more galling, such problems have existed for more than two decades. Middlemen have always levied high bargaining power over the farmers who have to agree to the prices fixed by them. In Kalimati market, for example, most fruits and vegetables are sold at 100 percent profit margin. The retail price of one-kilogram sweet orange in the early quarter of 2018 was in a range of NRs 70 to 80. But the farmers had to sell it at four rupees per piece rate. All because of middlemen. Nepali farmers have been complaining against this for over a decade. Farmers in Bhaktapur, Dhading and other parts have protested many times against yawning price gap. Regrettably, the government has not done anything about removing the middlemen from the scene, nor set the minimum price to protect farmers. This problem is very old but so is its cure. When India witnessed a ballooning food prices due to intermediaries, it restricted the activities of the middlemen by giving license to authorized middlemen only. The policy cut down of layers of intermediaries made market prices fair and consistent. In Nepal, Ministry of Agriculture, Land Management and Cooperatives (MoALMC) has launched a 58-point ‘Transformation-Roadmap’ with the objective of abolishing certain layers of middlemen and protect the farmers. This needs to be strictly implemented and violators must be punished. One another pragmatic way to monitor the price would be to license cooperatives. 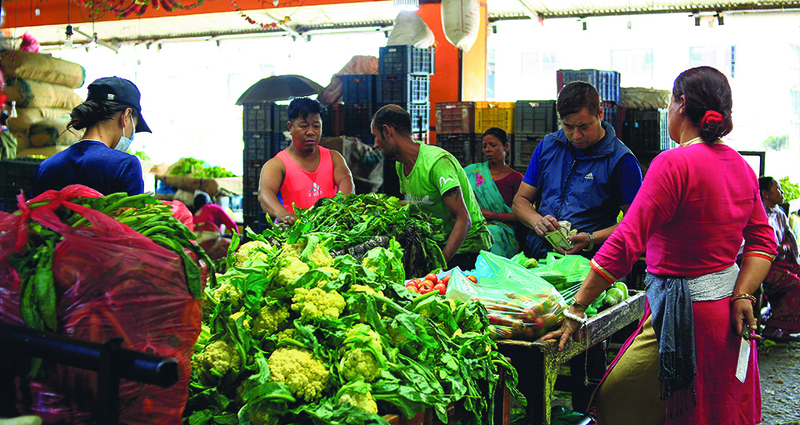 As authorized middlemen, they make sure that farmers do not get exploited in selling their produce at dirt price. They even should take the burden of warehousing and transportation. Let’s not forget, the middlemen are most adept at hoarding goods, manufacturing artificial scarcity and selling the goods at exorbitant prices. Likewise, banks must be liberal in giving loans to the farmers without collateral. Indian Central Bank has relaxed collateral to encourage institutional borrowing. Their farmers can now take loan up to IRs 100,000. Nepali banks should follow suit. Farmers are not financially strong. They rely on intermediaries to take their goods to the market. Leveraging farmers with capital will enable them to operate with less assistance from the intermediaries. Also, the government must facilitate direct selling. The Indian government promoted direct marketing under Agricultural Produce Market Committees (APMC) Act. This act permitted the farmers to sell directly to the consumers with a proper administrative system and limited involvement of the middlemen. In our case, direct selling won’t be possible unless there is proper market reach. The government must closely watch the middlemen. They should be severely punished if they are found in inflating market prices. According to the World Bank, a 10 percent increase in the prices of food in Africa can push a population of 10 million below the national poverty line. In 2010, Mozambique felt the heat as it witnessed a death toll of 12 when the price of staple goods increased by 30 percent. Let’s ensure that this does not happen in Nepal. Nepal’s economy is now walking on thin ice. According to Asian Development Bank, Nepal is already the poorest country in South Asia. Twenty five percent of the population is below the national poverty line and Nepali households spend 72 percent of their income on basic food. A notorious price augmentation can put our poor economy in imminent danger. Government and policy makers, beware.